When you heard George Osborne say six times in his Budget speech that he had moved Britain towards a “lower tax society”, he made a small but important mistake. He really meant “higher tax”. The independent Office for Budget Responsibility was crystal clear on the issue. 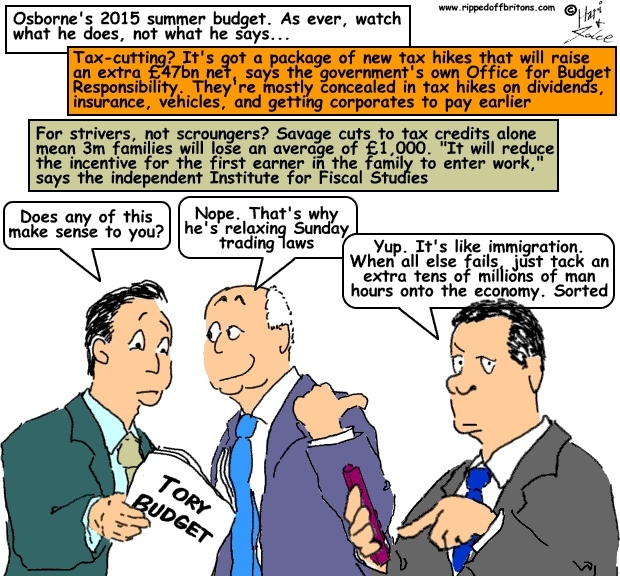 Robert Chote, its chairman, said that the whole Budget contained “a package of tax increases that will raise £47bn”. There were some cuts to corporation tax, inheritance tax and a rise in the tax-free personal allowance, which the chancellor dwelt upon in his speech. But Mr Chote pointed out that: “the tax increases are roughly twice the size of the tax cuts in aggregate”. The big revenue raisers are the new dividend tax regime, the 3.5 percentage point rise in insurance premium tax, higher rates of vehicle excise duty, restrictions in income tax relief for pension contributions for those earning over £150,000 and a huge one-off boost in corporation tax revenues as companies are forced to pay their bills earlier, helping revenues in 2017-18 and 2018-19. Meanwhile, the “tax avoidance, evasion and aggressive tax planning” clampdown that Mr Osborne highlighted in his speech has not been going to plan. Instead of raising £5bn a year from such measures from 2017-18 as promised in the Tory manifesto, the chancellor has found only £1.3bn. Thirteen million UK families will lose an average of £260 a year due to the freeze in working-age benefits, says the Institute for Fiscal Studies (IFS). Tax credit changes could hit three million families, which are likely to lose an average of £1,000, it said. George Osborne said anyone working full-time on the National Minimum Wage - taking into account taxation changes - would be better off. Under his new National Living Wage, all workers over the age of 25 will earn a minimum of £9 an hour by 2020. But even taking into account higher wages, people receiving tax credits would be "significantly worse off," said Paul Johnson, director of the IFS. The biggest impact on families will come from the freeze in working-age benefits and the changes to tax credits, said Mr Johnson. "It will reduce the incentive for the first earner in a family to enter work," he said. The number of families affected under the IFS analysis includes those who claim Child Benefit - which will be frozen from April 2016. The majority of families claim the benefit. The Resolution Foundation - a think tank that campaigns for low and middle-income families - said some families moving on to Universal Credit, or applying for tax credits after April 2017 could face much bigger losses. For example, a low-earning couple with with three children making a new claim would be £3,450 worse off, following the tax and welfare changes set out in the budget. The Chancellor used his first Budget as Chancellor in a majority Tory Government to begin a massive shakeup of Sunday trading laws that currently prevent businesses opening for more than six hours. He said that “there is still a growing appetite for shopping on a Sunday” and that businesses need the change to ensure that they can compete with online retailers. All shops other than the smallest premises are currently only allowed to open their tills for no more than six hours on a Sunday, a law which came into force in 1994 after a long struggle by the business community. Only shops with less than 3,000 square feet – essentially convenience stores and small independent shops - can open for more than six hours. Under the plans to be announced in the Budget, Sunday trading hours will become a devolved issue, meaning that mayors and local councils will be able to decide how long shops can open for. The Treasury believes that extending Sunday trading could create thousands of jobs and generate hundreds of millions of pounds a year in extra income for shops around the country. The new measures will be taken forward in the Government’s new Enterprise Bill in the autumn, the Treasury said.